I presented and facilitated a district wide experience this week for newly formed PLC’s. I designed the presentation around three quotes from Richard DuFour and my work with backwards planning featured in Instructional Coaching With the End in Mind. What area of student achievement will be the focus of our initial work? What measures do we have of our current status? 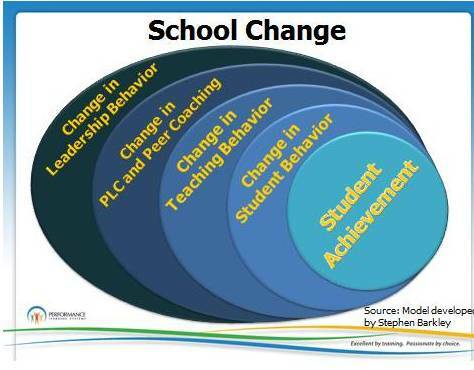 What student behaviors/actions would be needed to produce the desired achievement? What teacher behaviors are most likely to generate the desired student behaviors? I presented how PLCs most often develop through stages of individuals meeting to franchise activities to real teams. The key in being a team is shared responsibility for student success. As a second grade PLC of 5 teachers, are all responsible for all second graders’ achievement? As a math department PLC, are AP teachers responsible for student performance in remedial classes? I suggested that for continuous improvement members had to take their teaching “public”. Observing in each other’s classrooms and examining student work. A video clip illustrated how teachers could gain insights from assessing student understanding together. Returning to my backwards diagram we discussed how the work of PLCs should push school leaders and individual teachers. Learning in a PLC may uncover the need for school or system change pushing leaders. As learning uncovers ways to increase student success, the sense of team responsibility and a “public” teaching culture press teacher change. The power point for this presentation is available here. Thank you so much for sharing this and your power point. I am a reading coach and, I have been trying to bring these types of rich discussions into PLCs. As a facilitator at these meetings, I am struggling with moving teams of teachers beyond just sharing/swapping curricular work to having the types of discussions you highlight in your presentation. Vulnerability is a powerful thing, isn’t it? As the Principal I need help in defining the function of a Learning Community. Our school is very small with a staff of 24. We can meet to make joint decisions on about everything! I want a way to make sure these meetings are professional and productive. I’d like to use your PPT and Video. Thanks for the comments on PLC presentation. When you increase the shared accountability for student success it pushes the vulnerability … I can risk sharing a struggle as I know everyone is rooting for me to succeed.